This very smooth, white, 18 lb layout paper is perfect for quick sketches with pencil, pen, or felt markers. Won't bleed, fade, or wrinkle. Pens and markers can't bleed through. 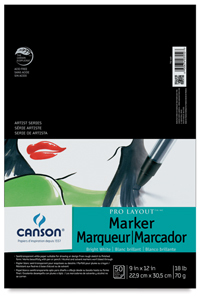 That makes Canson the professional's choice for rough layouts and rendering.